Recently we were invited over to Manchester’s Old Granada Studio to see what Red Bull’s ‘Culture Clash’ is all about and what Manchester’s eclectic underground music scene has to offer. The event is based on Sound Clash culture in Jamaica, where different ‘crews’ compete against each other to find out who has the loudest sound system and the best dub plates (records). Red Bull has taken this concept and thrown it straight into our very own urban culture, pitting different genres against one another. This year the clash has been held in Bristol and Manchester, ending with a massive blowout in London later this year. We arrived at Old Granada Studios in Manchester, and were walked into a huge room with four stages, each with their own towering sound systems. Each stage represented a different Manchester crew, battling through four rounds that saw them spinning records from a multitude of genres, special guests and crazy stage antics. After each round, the winner was decided from a decibel meter that hung directly above the crowd. Whichever crew got the crowd to make the most noise, won. Made in Manchester – A crew consisting of the biggest hip-hop and drum and bass Manchester has to offer (MC Trigga, Mark XTC, North Base, Rowney & Propz). Levelz – Manchester’s collective of the best MC’s and bass DJ’s around (Chimpo, Dub Phizix, Truthos Mufasa, Black Josh, Biome, Metrodome, to name a few). Dub Smugglers – The finest dub/reggae and jungle in Manchester (Dub Smugglers, Top Cat, Soom T, Kuntri Ranks, Kwasi and more). A Guy Called Gerald’s Basstronic – The man who pioneered acid house and paved the way for pretty much everyone at this event! After three intense hours of genre mashing chaos, we heard everything from drum and bass to reggae, with the entire crowd bouncing along to every beat. We saw the likes of General Levy, Liam Bailey and Bez from Happy Mondays make guest appearances throughout the night. But only one crew could win, and that crew was Levelz. 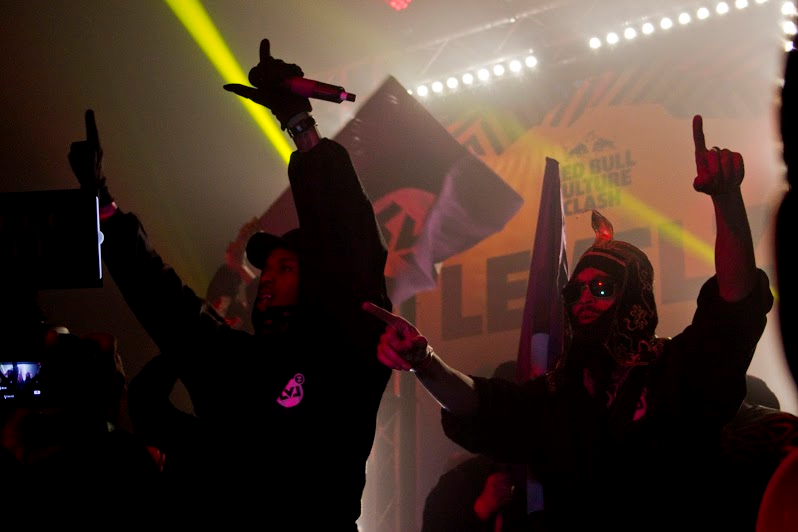 The next Red Bull Culture Clash is going to be held at ‘Excel’ in London, on Friday June 17. With the line up still under wraps, Red Bull has assured us that it’s going to be the biggest Culture Clash yet. With past events including Chase and Status, Shy FX, Annie Mac, Disclosure, A$AP Mob, Boy Better Know, Andy C and David Rodigan, you just know this next line up has got to be huge.